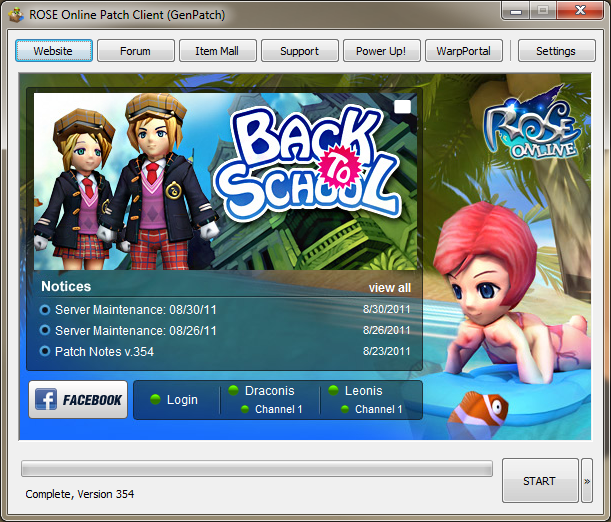 Please note that GenPatch is currently used as the official ROSE Online launcher, which is included with the official game installer by default. It is recommended that you use the official build of the launcher over the unofficial versions of GenPatch. - Improvement: Improved detection of corrupt clients in preparation for future restoration function. - New Feature: Addition of two extra customizable launcher buttons. - New Feature: The Terms of Service will now be displayed once per patch with the game client's removal of the Terms of Service. - New Feature: Added the ability to restore default values for most options in the Settings window. - Improvement: Added configurable option for Skill Bar Locking in the Settings window. - Miscellaneous: Updated the user interface & web based functions. - Miscellaneous: Compact Mode has been removed. - New Feature: RRE Settings - Commonly used RRE settings can now be configured through Settings -> RRE. This tab is only available when RRE is enabled through Settings -> Plugins. - Improvement: The START button will now change into a RETRY button if the patching process fails. - Improvement: Improved error handling and added HTTP keep-alive support to minimise the recent "Download Interruption" errors. - Improvement: Current game client version will be displayed in the status message once the patching process has completed. - Miscellaneous: Updated the Support and Item Mall buttons to use their new respective URLs. - Miscellaneous: Server status updated to include Draconis character and world servers. - Miscellaneous: Updated theme for server status and game update panels. - Improvement: Launcher Settings can be reset to their default values by leaving the Application and Parameter fields blank. - Improvement: Added consistent user interface to the GenPatch updater application and introduced version checking to reduce unnessecary updater downloads. - Bug Fix: GenPatch will no longer prompt users to close game clients which are not installed in the same folder as GenPatch. - Improvement: Attempting to download a plugin or mod while the game client is running will now display a warning to close the game before applying any changes. - Improvement: Failed file download attempts due to connection errors will be retried automatically several times before displaying an error message. - Improvement: Options to Check All and Check Plugins have been added to a popup menu next to the START button to make rechecking for updates more accessible. - Improvement: Plugins will rechecked for updates after making changes to the Plugin Settings. Users will be alerted to recheck when appropriate if updating is already in progress. - Bug Fix: Modifying the Auto Close checkboxes under Launcher Settings will now enable the Apply button correctly. - New Feature: Compact Mode - The patch client window can now be compacted to retain screen space using the [-]/[+] button next to the launcher buttons. - New Feature: Sound Settings - Allows the game background music and sound effect volume to be configured through Settings -> Sound. - New Feature: Proxy Support - Allows connections to be routed through a HTTP proxy server for users behind a firewall. This can be accessed from Settings -> Advanced. - Improvement: Users are now notified during patching if the game client is running and provides the option to automatically terminate all game instances before proceeding. - Miscellaneous: Renamed Settings tabs - Video Settings to Video, GenPatch Settings to Launcher, Plugin Settings to Plugins. - Miscellaneous: Increased the connection timeout period for patch server requests to 4 seconds. - New Feature: Defragment - Allows a full defragment of the game client VFS. This can be accessed from Settings -> Tools. - Improvement: Minor enhancement made to checking and patching times. - Miscellaneous: Reduced the connection timeout period for patch server requests. - New Feature: Check All - Allows rescanning of previous patches to download missing patch data and can be accessed through Settings -> Tools. - Improvement: The custom launcher buttons can now be configured to close GenPatch when clicked through Settings -> GenPatch Settings. - Improvement: Extra patch integrity checks have been implemented to ensure that downloaded patch files are not corrupted. - Bug Fix: The default genpatch.ini configuration file will no longer download 3rd party plugins by default. - Improvement: Installed plugins (GenFS, RRE and GenFS mods) can be enabled or disabled through Settings -> Plugin Settings. - Improvement: Automatic updates can be enabled or disabled for each plugin through Settings -> Plugin Settings. - Improvement: Custom launcher buttons which launch applications rather than webpages will now close GenPatch when clicked. - Miscellaneous: Converted all relevant RIP information to RRE in the Settings window. - Miscellaneous: Updated the patch window banner to include the new ROSE branding. - Improvement: The launcher buttons will now accept application parameters. - Bug Fix: Mishandling of the patch root address in the absence of a trailing slash. - New Feature: Plugin Settings - New and existing custom mods or plugins can now be configured for automatic updates through Settings -> Plugin Settings. - Improvement: Added and merged various internal configuration options in genpatch.ini. Added genmods.ini configuration to store plugin information. - New Feature: Custom Launcher Buttons - The launcher buttons at the top of the patch client can now be customised through Settings -> GenPatch Settings. - New Feature: Server Status Checker - An overview panel showing the current operational status of the game servers is now displayed on the main window. - Bug Fix: Changes to the Application and Parameters fields are now correctly applied while GenPatch is running. - Miscellaneous: Renamed 'Play ROSE' button to 'START'. - New Feature: Settings Window - The Settings button will now provide access to a new Settings dialog which allows you to edit GenPatch and game video settings (including support for custom screen resolutions). - Improvement: Added progress bar feedback during the VFS defragmentation process. - Improvement: Replaced numerical status message with mini progress bar to display current patchlist progress during the patching process. - New Feature: Automatic RIP Updates - If Rescudo's Ignore Plugin is installed, GenPatch will check for updates and download the latest version of RIP automatically. - Bug Fix: Fixed incorrect 'pulsing' progress bar state in Windows XP. - Improvement: Improved error checking and more meaningful error messages are displayed when appropriate. - Improvement: When the SevenHearts.ini configuration file does not exist, it will now be created automatically with the default configuration. - Bug Fix: Minor bug fix for extracting patch files that don't exist. - New Feature: Automatic Updates - Future updates for GenPatch will automatically download and install as part of the regular patching process. A. GenPatch is a patch client and game launcher designed for users who have been having issues getting the new patcher to work correctly under their system configuration, and is available as an unofficial alternative to all users who would like to take advantage of the additional functionality on offer. GenPatch allows users to launch custom plugins once the patching process has been completed and provides buttons to easily access ROSE NA's core services. Q2. How do I install GenPatch? A. Download the provided zip file anywhere on your computer and extract the file contents into your ROSE Online Evolution folder (e.g. C:/Program Files/Triggersoft/Rose Online Evolution/). The file genpatch.exe must be located in your ROSE Online folder to operate correctly. If you wish you can create a shortcut to genpatch.exe by right clicking it and selecting Send to -> Desktop (create shortcut). Run genpatch.exe or the shortcut to execute it. Q3. Does GenPatch require the .NET Framework to run? A. No. GenPatch was written with users in mind who have been having issues running the official patch client which relies on the .NET Framework. GenPatch has no system dependencies other than ROSE Online itself. Q4. Why does ROSE crash after a new install? A. GenPatch creates a SevenHearts.ini with a default configuration when one does not exist to combat this issue. It is recommended that you check your video settings through Settings -> Video Settings if the game has been installed for the first time. Q5. How do I launch a plugin instead of the game client when patching is complete? A. GenPatch allows users to specify an alternative application or plugin to launch instead of the game client when pressing the START button once patching has completed. To do this, navigate to Settings -> Launcher and modify the Application and Parameters fields with the appropriate information for your application. Q6. I made a mistake while editing genpatch.ini, how can I fix it? A. Simply delete genpatch.ini (located in your ROSE Online folder) and restart GenPatch which will create a new configuration file with all the default settings. Q7. I recieved an HTTP Error message box, what does this mean? General/Connection Error (Code 0): Ensure you have a stable connection to the internet and have added genpatch.exe to your firewall's exception list. In certain system configurations running under administrative privileges may be required to use GenPatch. This error may also occur when the patch server is offline or unavailable. Download Error (Code 1XX, 3XX, 4XX, 5XX): If the default settings are used, there is a malfunction with the patch server which prevented a file from being downloaded correctly. Q8. Will I still have to run the official patch client when GenPatch is installed? A. No, GenPatch is designed to be a full replacement to the official patch client/launcher meaning you should never have any need to run the official client while GenPatch is installed. However, you may continue to use the official patch client at your own discression. It is highly recommended that you do not run both at the same time as this may provoke undefined behavior that could corrupt your game installation. Additonally, GenPatch also replaces the need for use of the TriggerDetect utility to change video settings as this functionality is available through the Settings window. Q9. GenPatch is stuck on "Defragmenting VFS, Please Wait..." or is taking a long time to complete. A. Defragmenting the VFS involves reorganising the game files after a new patch has been installed and may take a few minutes (some VFS files are several hundred megabytes in size), please be patient while it completes this process. Q10. GenPatch or ROSE crashed after attempting to patch with the official launcher, what could cause this to happen? A. If you have previously attempted to update the game with the official patch client and aborted it unexpectedly due to some other error, your game client may have been corrupted in the process which will affect GenPatch's ability to apply any patches and update the client correctly. The best course of action to take in this case is to reinstall ROSE and run GenPatch first to ensure that you are updating an uncorrupted game client. Before reinstalling, trying the Check All feature located in Settings -> Tools may repair a game installation that is missing files. Once a patch has started downloading it is strongly advised that you do not run any other patch clients until the update has completed using the current patch client (i.e. do not mix GenPatch and Gravity's launcher during a patch) as this may invoke client corruption. Q11. How do I set up my client to automatically log into the game? Q12. I have downloaded and enabled a plugin using the Plugin menu but it does not load, how can this be resolved? A. All plugins that are managed through the Plugin menu require GenFS to operate which can also be downloaded and enabled through Settings -> Plugins -> GenFS. Alternatively, for application type plugins such as RRE, refer to Q5 for further information. Edited by Genesis, 01 June 2015 - 02:47 PM. - Bug Fix: Newly discovered/downloaded clan marks will now appear correctly. - Bug Fix: Temporary files and folders will be deleted correctly when not in use. - Improvement: Redesigned the file handling mechanism which significantly improves file loading speed (by approximately 50%). - Improvement: Improved handling of loaded files when multiple instances of ROSE are running simultaneously. - New Feature: Local File Loading - Enables overriding of files using the local filesystem. Note: Local modded files must meet the same restrictions enforced by GenFS archive loading. - Miscellaneous: Added the file types GENFS, ZIP, DLL, EXE, IDX, VFS, INI to the file loading white list. - New Feature: DLL Plugin Support - Advanced DLL style plugins (including RRE) can now be managed from GenPatch -> Settings -> Plugin Settings or genmods.ini. Note For Modders: DLL plugins must have a function export called "Init" (i.e. "__cdecl void Init()") to be loaded by GenFS. - Miscellaneous: Removed file type restrictions from the PLUGIN folder to accomodate 3rd party plugin storage. - Miscellaneous: Added SOUND folder to the list of supported folders. - Miscellaneous: Added WAV and OGG to the list of supported filetypes. - Improvement: RRE can be enabled/disabled from running automatically via GenPatch -> Settings -> Plugin Settings -> RRE -> Enable Plugin. - Miscellaneous: Added PLUGIN folder to the list of supported folders. - Improvement: GenFS mod files are now selectively loaded from the genmods.ini configuration file when it exists. A. GenFS is a plugin for the ROSE Online game client which enables players to install user created content such as custom user interfaces (see Q7 for restrictions) without altering the game installation. This plugin provides an easy method for mod developers to package and distribute their mods using a standard format, aswell as a clean and safe method for end users to install and maintain the mods they have downloaded. Q2. How do I install GenFS? From the patch client, navigate to Settings -> Plugins. Click New Plugin... and enter the plugin name as GenFS. Note that the name must be entered exactly or GenFS won't load. Check Enable Plugin and Check For Updates. A sample mod for GenFS is available here to verify that the plugin has been installed and is operating correctly. Q3. How do I uninstall GenFS? A. To uninstall GenFS, you will have to delete the files GenesisVFS.dll and IJL15.dll from your ROSE Online folder and redownload the original IJL15.dll file which is available here. Q4. How do I install/uninstall a mod that I have downloaded? A. Mod files that are compatible with GenFS have a .genfs file extension. For manually downloaded mods, first copy the .genfs file into your ROSE Online Evolution folder (e.g. C:/Program Files/Triggersoft/Rose Online Evolution/). Note that GenFS mod files are designed to be used without the need for extraction. Launch the patch client, and navigate to Settings -> Plugins. Click New Plugin... and give the plugin a short and meaningful name. Check Check For Updates if the mod author has provided an Update URL. Enter the URL provided by the mod author in Update URL. Enter the filename of the mod in Plugin Files if no Update URL has been supplied. If the mod doesn't exist, it will be downloaded and the Plugin Files field will be filled in automatically with all appropriate filenames. For manually downloaded mods that do not have an Update URL, you will have to fill in the Plugin Files field yourself. Each GenFS mod can be enabled or disabled from loading by checking or unchecking Enable Plugin. To uninstall a mod, delete the mod from your plugin list, then delete or move the .genfs file out of your ROSE Online Evolution folder. Q5. Certain GenFS mods are causing the NPC dialogue text to disappear, how can this be resolved? A. On Windows Vista/7, it may be nessecary to run the game with Administrative privileges. To do this, navigate to your ROSE Online Evolution folder (e.g. C:/Program Files/Triggersoft/Rose Online Evolution/) and right click TRose.exe then select Properties. In the Compatibility tab, ensure that the Run this program as an administrator checkbox is ticked and press OK to apply the changes. Q6. As a mod developer, how can I package up my content for use with GenFS? A. The mod files that GenFS uses are essentially standard ZIP archives which have been renamed to use the .genfs file extension. To package up your content for distribution, create a regular ZIP archive and add your files into it making sure that the folder structure matches what would be expected by the VFS. For example, if you wanted to use a custom version of 3DDATA/CONTROL/XML/DLGITEM.XML, you would have to create a folder structure within the ZIP archive with a folder called 3DDATA, which contains a folder called CONTROL, which contains a folder called XML, which contains your DLGITEM.XML file. Once you have added your content to the ZIP archive, rename the file extension from .zip to .genfs. You may then distribute your GenFS mod file to end users who will be able to install and use it. Q7. To what extent can I modify the client? A. GenFS does not endorse usage of the plugin for malicious or abusive modifications to the game client which do not adhere to Gravity's Terms & Conditions. To limit the potential abuse that may come with modifying the client, the current list of filetypes that can be modified are listed below. Please note that these restrictions may change over time to accommodate future requirements. #1. Gravity Copyright and Terms of Service image or text files cannot be modified (e.g. COPYRIGHT.DDS). #2. Tutorial splash screen modifications only (i.e. 01.DDS - 14.DDS). #3. No file type restrictions apply to the PLUGIN folder. Q8. GenFS has been installed, why are the mods I download not being loaded? A. Firstly, ensure that all mod files are placed in the same folder that GenFS has been installed to and that the stages in Q4 have been followed through. Browse to your ROSE folder, press the Alt key to show the menu bar and select Tools -> Folder Options. In the View tab, uncheck Hide extensions for known file types and click OK. Ensure that the mod file doesn't end in .zip (as it should be yourmod.genfs). Change the file extension to .genfs if it isn't already then go back into Folder Options and check Hide extensions for known file types to restore your original settings. Note: When downloading a file in Internet Explorer it automatically detects the mod file as a ZIP archive and renames the file extension. To get around this, right click the mod's download link, select Save Target As and change the file extension from .zip to .genfs so the mod will be named correctly once downloaded. Edited by Genesis, 01 June 2015 - 01:50 PM. Either send me a PM or use this thread to report bugs and suggestions. Edited by Genesis, 22 July 2010 - 05:14 AM. Hi, this is going to a be a stupid question and im probably going to get moaned at for it, but how do i install the new Genpatch version, do i just delete the old one from the Rose Online folder and replace it with the new one? Just download the standalone one, the first one and manually place the exe into ROSE folder and you are done. Then use it to run the game. this is going to make me sound like im retarded but what if i cant find my rose folder and ive done the search for it how do i make a new 1??? You shouldn't have to make a new one. Unless you changed where it was installed, it should be in C:\Program Files(x86)(x86 if your system is 64 bit)\Gravity\Rose Online. Otherwise find your Rose launcher icon and go to properties and it should tell you where you have it installed. Try the methods listed in the Rose Online Technical Support subforum. i also have a problem with genpatch. i startet genpatch....and after klick " start" the genpatch updater startet. then it says the update is complete ,click continue to start. but if i click continue...nothing happens...the updater closed but thats all. Make Sure your running in Admin mode. hmmm... doesnt work.....may i did anything wrong. i know we had a thread how to change to admin mode...i search.hope i find it. hmmm...its all ok..the changes i made was right. Edited by littlekami, 23 July 2010 - 07:37 PM. Edited by ShaiMun, 07 August 2010 - 09:31 PM. The patch notes and server status pages are temporarily unavailable due to an unexpected hosting failure but should be available again by the end of the day, if not tomorrow. It's likely that your game client is corrupted, reinstall and patch up using GenPatch to make sure you're patching an uncorrupted client. the downloads arent working for me. it only opens in word, thats all.. It says i need GenFS to use the GlossyOnes, but I already tried the instructions here but still the Glossy didnt work. Make sure you've set up GlossyBLUE as follows (replace GlossyBLUE with the colour you want to use), and have checked "Enable Plugin" and "Check For Updates" under GenFS. Also make sure that you have no running game clients when adding new plugins so that the client can be updated as nessecary. One more problem, why does my client crashes before entering the "Terms & Condition"? Most likely it didn't install/update properly.